Over the next year we will be running a variety of exciting projects in local schools. We are thrilled that the Heritage Lottery Funding enables us to do this and build a stronger relationship with children and teachers in our area. There are three strands to this project, working on the history of the manor, heritage, folklore and creative writing with three local primary schools, dance with middle school age and music leading into our Young Halsway programme with two local colleges. Over the past three months four classes across three local primary/first schools have been working with our creative lead Alice Maddicott on an exciting creative writing project inspired by the wider heritage of Halsway. Crowcombe, Old Cleeve and St Peter’s, Williton each spent three days with Alice, starting with a kick off day at the manor to really inspire their creative ideas and to create their own imaginary Halsway. Children both used real happenings from Halsway’s history and their brilliant imaginations to create fantastical manors; places where the manor’s memories floated round its rooms, where the manor could speak or grow wings and fly over the local area, where the creatures carved in Halsway’s wood and stone came to life and interacted with visitors today or characters from Halsway’s past. This first day was followed up by a workshop in the school, using the local area and its heritage to inspire the creation of wider imaginary worlds as settings to expand the children’s writing. The final day was spent up on the Quantock hills exploring descriptive writing and how our local landscape can be brought to life with writing and how in turn our writing can come to life when we are inspired by the world around us. A wide variety of writing was created – from maps to travel guides, description and stories. Feedback from the workshops has been incredibly positive, with it being noted that many children who are normally reluctant to write were really engaged and enjoyed the experience. It was noted that local children now felt that Halsway was a place where they were welcome and that was alive in their imaginations as a place of inspiration. They all were keen to come back and build further links with the manor. It was also noted that one of the biggest challenges facing children and writing today is a fear of getting it wrong and a general lack of confidence that a more prescribed curriculum can inadvertently foster. These workshops helped children overcome this fear of writing and consequently their writing and wider creative thinking flourished. As one teacher put it : ‘The project has given them the permission to be free’. UPDATE May/June 2018: The Workshops have now started! Over the past month GCSE students at Haygrove School in Bridgwater and West Somerset College in Minehead have worked with musicians Sam Kelly and Archie Churchill Moss, whose band Sam Kelly and The Lost Boys are Halsway’s Artists in Residence for 2018. Each college spent two days working to learn and arrange traditional Somerset tunes. The majority of students had little of no knowledge of folk music before the workshops and it was brilliant to see how they embraced the genre and used their musical skills to bring traditional tunes to life in a new way that was uniquely theirs. The workshops have led to really exciting different outcomes. The Haygrove students recorded their arrangements and went on to perform them at the school end of term festival Glastongrove! 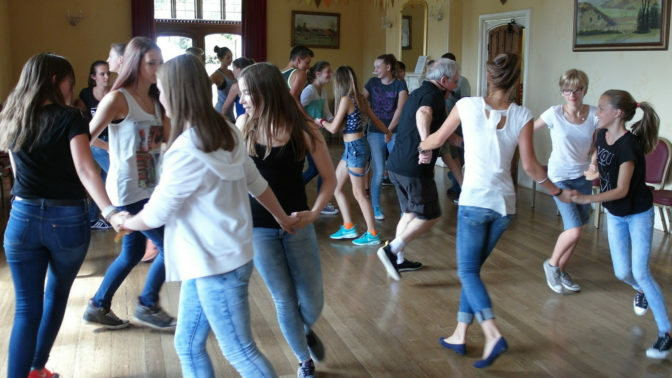 The West Somerset College students are continuing their development as folk musicians and work with Sam and Archie, with a group attending our Young Halsway Intermediate residency, which leads to a performance at Sidmouth Folk Festival. Keep checking back for more updates as the other school workshops take place throughout the year.